Christine Lenzen (b. 1984 Minneapolis, MN) is a visual artist that uses photography, sculpture, and collage to explore the cultural implications of the photograph. She received her BFA from the University of Minnesota - Twin Cities and her MFA from the University of Notre Dame in May 2012. Lenzen is currently an Associate Professor of Photography at Northern Michigan University in Marquette, MI where she has been teaching for seven years. At face value, the photographs from the series In the Woods are an homage to our natural world’s picturesque beauty. 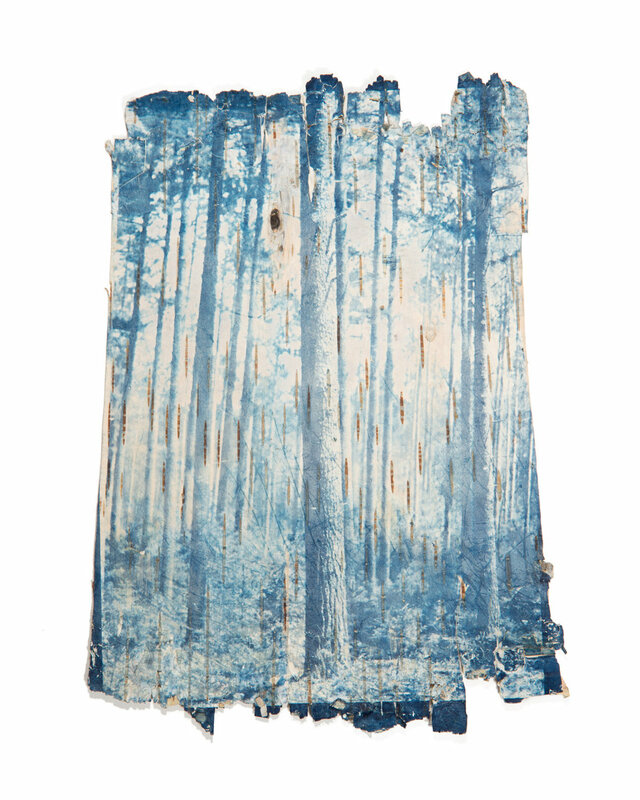 For each piece, portraits of trees are printed directly on birch bark using the cyanotype process. Every tree in the forest is unique, and similarly, due to this printing process no piece from this series can be exactly replicated. 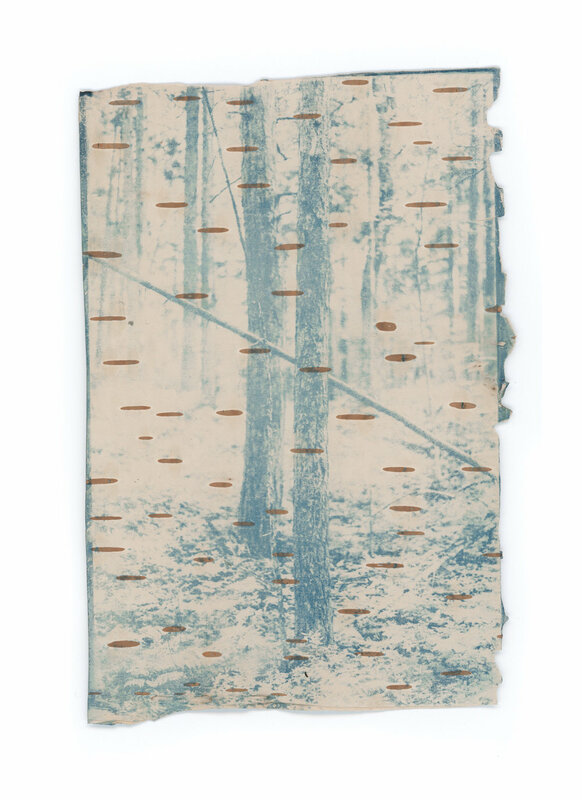 However, due to the high acidity of the birch onto which these images are printed, over time every one of them will likely change color, degrade, and eventually vanish. While we may revere the natural world’s beauty, societally we practice a disregard for its future. Without preventative measures, our beautiful natural spaces, like these images, will continue to disappear. The photography concentration within the School of Art & Design at Northern Michigan University starts with a strong foundation of technical expertise and compositional awareness. The lower-level classes are rooted in giving students a strong foundation of technical skills and visual literacy; Students learn how to use their cameras as a tool to successfully make the photographs they envision, how to produce professional-grade inkjet prints, how to employ basic studio lighting techniques, about film photography and traditional methods of analog production, and advanced post-processing methods with software such as Adobe Lightroom and Photoshop. As students move through the upper-level courses, the foundational skills that were learned in the earlier classes are built upon - students learn advanced studio lighting techniques, alternative and historical photographic processes such as cyanotypes and van dyke brown among many other skills. Upper-level classes also provide an in-depth exploration into concept development and the creation of meaning within photographic works. Students leave their last class with several portfolio ready series of works - which they can then use to apply for jobs, graduate school, or exhibitions. Whether you come to the program interested in commercial, documentary, or fine-art photography - the program leaves room for each individual student to follow their interests and develop portfolios that will help them succeed in their desired career path. The School of Art & Design right now is an undergraduate program only – which is awesome in a lot of regards, because it enables the professors to work with students throughout all levels of our courses starting immediately with the introductory level course, which students have the option of enrolling in their first semester. Our second-level course, Methods & Techniques, introduces various methods of working beyond the digital camera such as studio lighting techniques and film development. There is also a stronger emphasis on basic concept development. In the third-level course, The Extended Image, students explore a self-assigned general concept through various process or conceptual methodologies including alternative photographic processes, image and text, sequencing, alternative presentation solutions such as installation and bookmaking techniques, and advanced software applications such as image manipulation. The offerings in the course change from semester to semester and students are encouraged to take the class more than once. The senior-level class is a seminar course in which the primary focus is on preparing students to transition from art student to professional artist. Students prepare a professional-level portfolio throughout the semester, while also developing tools they will need in either a commercial application or artistic application of photography (“the boring side of the art world” – CVs, Resumes, Grant Writing, Exhibition Opportunities, etc.). Students are also encouraged to take this class more than once as the specific focus of the course changes from semester to semester. In respect to my teaching philosophy – while all courses are designed to give students an understanding of specific skills, I consider myself more of a guide for students. The curriculum is fluid enough to allow students to research their own interests (whether that is advanced lighting techniques, different alternative processes, specialized digital post-processing techniques, etc.) – and I put emphasis on research and experimentation in my courses. Starting in the second-level course, students start to integrate contemporary working methodologies with traditional photographic practices for a color film project in which the final product is a digitally printed image. In the third-level course, students learn how to make digital negatives for various alternative processes. From there they are encouraged develop their own workflow depending on the work they are producing and where their interests lay – whether that is fully digital, fully analog, or mixed. While we are certainly living in a digital world, being able to produce a high-quality physical photographic print – whether digital or analog – is an important aspect of being a professional. We have several large-format professional printers designated for student use, a beautiful large group darkroom (20 enlargers), an advanced-level darkroom (4 enlargers), and space for alternative processes with UV exposure units. Generally, there is an in-class critique for every creative project. I teach students to Describe, Analyze, Interpret, and Evaluate during critiques – I like to call it “DAIE-ing” (dying) which always gets a laugh – because as I am sure most of us have experienced, sometimes the critiquing process can be mentally exhausting. However, learning to critique photographs effectively is an important skill to becoming a better photographer. By analyzing and evaluating other people’s work, you will be more easily ready to begin critiquing your own work by thinking objectively about how you could make it more successful. In lower-level courses, critiques take place on the day that the assignment is due with the understanding that they can redo work for re-evaluation. In upper-level courses in-progress critiques are held a week before an assignment is due in order to give students an opportunity to apply some of the feedback they received during critique to their final work. There is no portfolio requirement to become an art major at NMU. Instead, we have a class called Individual Art Review that students usually take in their Junior year. For this course, students work closely with their major advisor to produce a strong portfolio which they will present and defend to a panel of faculty towards the end of the semester. It is a benchmark course – you must pass this course in order to continue on through the program. It gives students valuable experience of professionally presenting work and fielding questions about that work.